A.C. Perch Tea Shop has been selling the finest tea since 1835 when Niels Brock Perch first opened it’s doors. Said to be one of the oldest teashops in Europe, the tea shop has since expanded to include a Tearoom upstairs to enjoy afternoon tea delights. Ferdinands Fryd or rather Ferdinands Delight is the Danish take on a Devonshire Tea. Far more sensible is to book a table for afternoon tea with food rather than just stop by for a pot of tea. A pot of tea in the tearoom is a whopping 85kr ($16.30) and a Devonshire Tea inclusive of the 85kr pot of tea is 110kr ($21) – go figure? It’s gloriously sunny the day I visit so there’s only a smidgen of people and I have the undivided attention of the waitress. After asking too many questions about 150 teas, I am invited to sniff my way through several canisters before making my choice. So vast is the selection and difficult the choice, the waitress kindly offers to give me two pots of tea with my scones so I could try the very expensive Japanese Green Tea I was eyeing off. My afternoon tea spread arrives served on Royal Copenhagen porcelain dinnerware and feels superbly decadent. 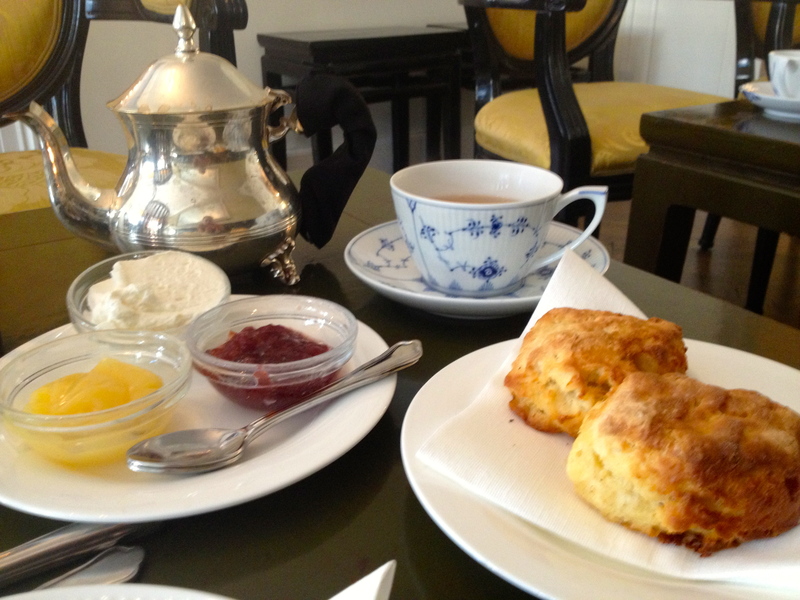 Rich buttery scones are served with both strawberry jam, lemon butter and thickly whipped cream, the said clotted cream on the menu didn’t appear. Advice? Peruse the tea menu online before you arrive, so less time is spent pondering and more time for enjoying! It gets busy so bookings are essential. Tea: An incredible 150 choices of loose-leaf teas to suit every taste served in a magnificent silver teapot. Overall: The quintessential tearoom with a Danish twist.